Lanterns: Could #ImpeachTrump Finally Shatter the Republic? Could #ImpeachTrump Finally Shatter the Republic? During the lead-up to the Presidential election of 2016, several #MainstreamMedia outlets published less than flattering accounts of militia groups such as the Oath Keepers and the Three Percent Security Force. In these stories, large outlets, such as the New York Times and Reuters, painted a picture of stereotypical gun-toting right-wingers playing soldier in the woods in order to fan the flames of paranoid liberal panic. This is not going to be one of those stories. What I bring to you today, dear reader, is a serious question: What happens to this nation if President Donald Trump is impeached, found guilty and ordered to stand down as President? I’ll refer you first to a message off of MeWe that seems to indicate a serious problem consistent with the rhetoric. Let’s let that sink in for a moment, and realize that the militias of our nation are not the simple folk “clinging to their God & their Guns” that the leftist media has worked for almost three decades to portray. The modern militias are sophisticated, well-equipped, and largely honorable volunteers supporting the public good, who are devoted to upholding the ideals of the Constitution. These groups are primarily comprised of veterans and retired law enforcement officers with a functioning knowledge of strategy, tactics, and law. 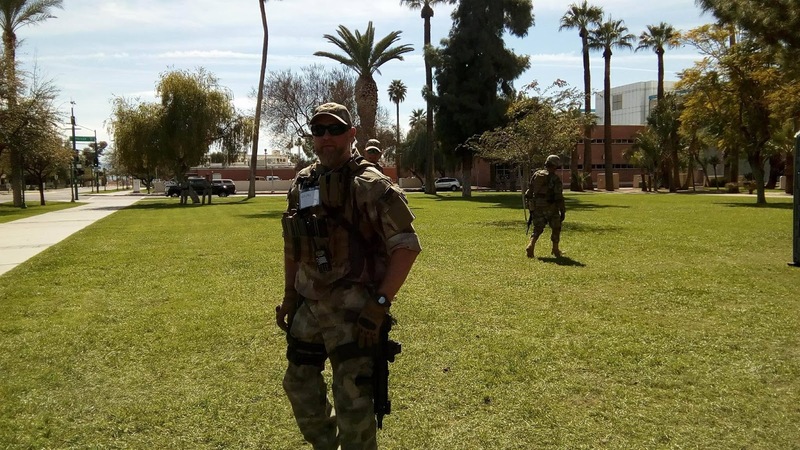 As pictured, militia-men who deployed Saturday during the March 4 Trump Rally in Phoenix, were nearly indistinguishable (and widely mistaken for) the US Army National Guardsmen. Is it conceivable that were President Trump impeached, we could find ourselves embroiled in a second American Civil War? 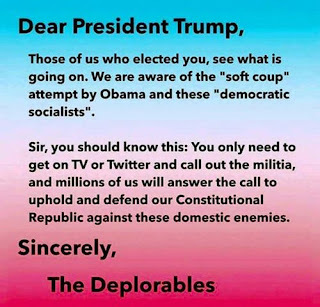 A war waged between regular military forces loyal to Washington and the self-proclaimed “Deplorable” leaning militias coming to the defense of their elected President? “The Three Percent Security force, named after those who fought in the American revolution (It's said - only three percent of the colonists fought against the king's tyranny) says they're preparing to "uphold and defend the constitution from all enemies, foreign and domestic." “Active and armed” to defend the Constitution “from all enemies, foreign and domestic.” The danger present is not in these volunteer soldiers, but in us. 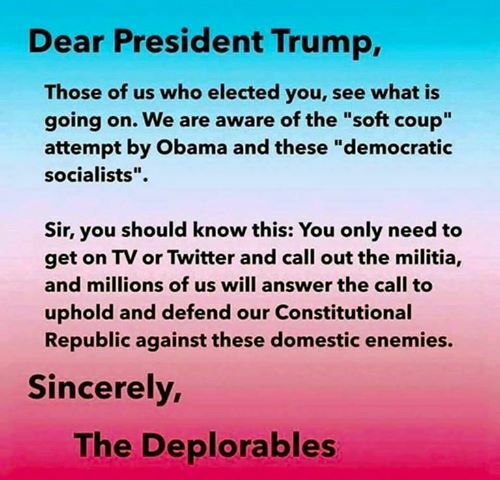 It is we who will decide who the “enemies” are, and if we continue to view our fellow Americans as the enemy, then civil war is inevitable, regardless of who the actual combatants are. As hard as the forces of ideological difference, media sensationalism, and intolerance drive us apart, we must fight desperately to wage peace and bring our opposition back to the table with respect. It is only by remembering that we are ALL Americans, and that our Government is, can, and must be controlled by the ballot box and not the ammo box, that we will remain free. Each war since the American Revolution has been utilized by those in favor of Big Government to further curtail our liberties: the war of 1812 brought the Alien and Sedition Acts; The Civil War gave us a waived Habeus Corpus, and a disregarded 10th Amendment; WWI gave us the Espionage Act and the Income Tax; WWII gave us the Military Industrial Complex and McCarthyism, and finally, the War on Terrorism has brought us the Patriot Act and the FISA Court. Another Civil War in this nation will not bring additional freedoms. It will bring naught but death, destruction, and oppression as the surviving government, regardless of who “wins,” would know too well their own fragility and act to protect themselves from the same fate as their predecessor. While this quote is usually applied to the military it can fit the militia just the same here: "People sleep peaceably in their beds at night only because rough men stand ready to do violence on their behalf." - George Orwell. We must work ceaselessly to never need them.